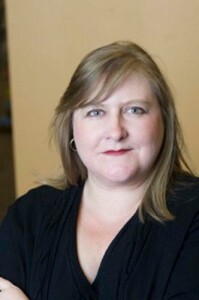 It is with great pleasure that we welcome Sherri Browning Erwin as our author of the month with Jane Slayre. New York Times bestselling Pride and Prejudice and Zombies is often considered the first of the literary mash-ups, but it is hardly definitive of the genre. Many new authors are approaching classics in the public domain with new twists and spins, retelling favorite stories in new ways, often with comedic and paranormal elements, but not always with irreverence. My take on Charlotte Bronte’s Jane Eyre, with Jane as a vampyre slayer (Jane Slayre, Gallery Books, 2010), “raised the bar for monster classics” according to Library Journal. I have a love and respect for Bronte’s original material that I hope shines through, even with the added comedic elements of Jane Slayre. What made me think of writing Jane Slayre? My daughter was about to read Jane Eyre in class and I started to remember everything I loved, and wanted to change, about the original. Pride and Prejudice and Zombies was just taking off, and I thought, “what if Jane Eyre had to deal with zombies? Or vampires?” And the title, Jane Slayre, came to me. 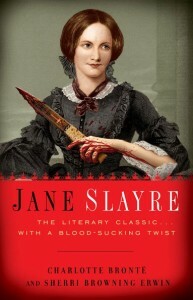 Jane Eyre, the strong female character that I adored, could be a vampire slayer. Why not? The story took off in my mind from there. I thought of Jane’s aunt and cousins as vampires, an insidious plot turning the children of Lowood into zombies. And what about Mr. Rochester? That wife in the attic… What had started as a simple “what if” exercise in my mind became a story begging to be told and a mash-up was born. But you may still be asking, what is a mash-up? From Wikipedia: A mash-up is a work of fiction which combines a pre-existing text, often a classic work of fiction, with a certain popular genre such as vampire or zombie narratives. The term “Mashup” was borrowed from the world of computers and music, as Adam Cohen stated in his New York Times editorial about Pride and Prejudice and Zombies: “The idea of combining two data sources into a new product began in the tech world (also think music remixes) and is spreading — including to book publishing.” I think of mash-ups as more of an organic evolution of parody in literature. There is more than one way to approach a mash-up, and the styles and tones of mash-up authors vary as much as styles and tones of authors in any other genre. A common misconception is that all one has to do is take a book that someone else already labored over and stick in some zombies, werewolves, vampires, and voila– mash-up! Actually, it’s quite a bit more complicated than simply grabbing a classic and inserting new scenes with paranormal elements. In fact, to get it right, with the new seamlessly incorporated alongside recognizable classic lines, it takes as much or more work than writing a new original novel. It’s not easy to match one author’s voice to another’s, and most authors are fairly set in their ways, solo artists not used to harmonizing. I had to learn some new skills and get to know my dead co-authors very well, by reading their words over and over. Only once well-acquainted with their works could I play with their phrasings, move words around, learn which ones I could lose, and add new lines and twists of my own. I have published four completely original novels and I am at work on more, but the appeal of the mash-up for me is the ability to revisit some of my favorite books, get to know them more intimately, and make changes that I have always thought would add a new dimension, or some unpredictable twists. I love playing with words, and I love classic literature. Why not have some fun and combine them, my twisted humor and beloved classic plots and characters together? It works because everyone knows the story of Jane Eyre, for example. Almost everyone has read it and loved it, or hated it, for different reasons. My second mash-up, Grave Expectations, came out in August 2011, also from Gallery Books. Well, we can only guess.